The prophethood mission of Prophet Muhammad (pbuh) provides guidance for a perfect balancing of individual and spiritual life with social and material life. In accordance with the requirements of their beliefs, Muslims accepted Prophet Muhammad’s guidance in both fields and were more interested in his guidance for individual and spiritual life than his activities as the founder of a new social order. Thus the literature about his life developed within the scope of these developments. As a matter of fact, the establishment of the social life throughout the history in Muslim societies around the basic rules specified in Quran and sunnah (practices of the Prophet) proved to be effective and was regarded as a goal to be reached for an orderly and peaceful social life as well as for a virtuous individual life. Within the framework of the common viewpoint separating the material fields of religion and life, the consideration of prophethood by the western world as only guidance for individual and spiritual life is one of the leading problems encountered in understanding the social mission and historical role of the Prophet. Thus, his teachings are considered to have been too much engaged in social and political issues. Furthermore, western society still holds prejudices and negative thoughts shaped throughout the Middle Ages in relation to Prophet Muhammad who founded a rival civilization which they battled for centuries. The extraordinary success of the Prophet as the leader of a movement which had worldwide implications can be explained by two aspects, one spiritual, the other material. The first aspect, generally accepted by religious scholars and other Muslims, holds that Muhammad was chosen as a prophet by Allah, thus the source of his success was divine. The second, embraced by western researchers and historians, supports the idea that his success resulted from historical and other experiential motives as well as his distinctive leadership skills and charismatic personality. These aspects of the Prophet reflecting both ideal personality and historical personality are regarded as models in Islam. They do not contradict each other, and each requires separate examination following the research and analysis methods. The help and support from Allah to His messenger is undisputable, but failing to consider Muhammad’s great skills when explaining the success of the Prophet thus risks decreasing his greatness as a person to a level of being a minor instrument conveying merely a divine message. It must be pointed out that with his great individual skills and virtues the Prophet led a life of simplicity which was witnessed by other people. If not, his life would not have been considered a perfect model for humanity as stated in the Holy Quran. Since he was sent as a guide to all people with a wide variety of characteristics including moral as well as emotional and aspirational needs, he was granted with the spiritual and mental maturity that embraced the individual and social needs, and problems of these people. His policies contained such breadth and depth that they applied to all individuals and societies, and with great sensitivity to the enormous range of human nature. In the history of man, Prophet Muhammad was the first prophet and leader to have succeeded in personally putting into practice his policies in the political, legal, economic and social fields. Such implementation of his guidance and leadership mission to humanity was testament to the sublime quality of the Prophet. The mission of the Prophet did not just consist of the revelation granted to him by Allah. Inviting people to his religion, explaining the principles of the religion, personally practicing them (Al-Baqarah 2/151, Al-i Imran 3/164, Al-Jumua 62/2), directing and managing the society to which he was sent and establishing a new model of society were important aspects of his mission. In fact, the purpose of prophethood is not to just convey certain principles to people but to also achieve individual and societal transformation. In other words, he had to lead by example. Although Prophet Muhammad is a human and a worshipper of Allah, the mission given to him, and the moral personality coming from this mission, make him unique among others. The Holy Quran mentions the Prophet’s human nature, but clearly points out his special status and authority among other people. 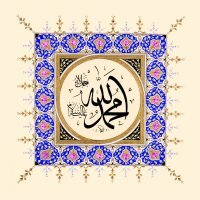 The fact that Allah orders people to obey Himself and Prophet Muhammad, and to refer to Himself and His messenger on occasions of conflict (An-Nisaa 4/59) shows that the acceptance of Prophet Muhammad’s authority in political and legal fields is a condition for both faith and obedience and related to each other. Forming a model Islamic society by the Prophet was only possible because of his authority. As mentioned above, his authority over the Muslims for being the leader of the ummah (Islamic community) is stated with hukm (provision) and similar terms in the Holy Quran (An-Nisaa 4/60, 65). These verses indicate the requirement of obedience to the Prophet along with acceptance of his decisions without argument, and thus consider him as a judge. While obedience to Allah is a foundation for the obedience to Prophet Muhammad, the obedience to Prophet Muhammad is the sole tangible evidence of the obedience to Allah: “Whoso obeyed the messenger has obeyed Allah” (An-Nisaa 4/80). Obedience to Prophet Muhammad is not only binding the religious field but also the social life because his prophethood mission is not limited with intellectual and spiritual advice. It also includes social, political and military activities in terms of the aim of founding an Islamic society. The framework of a traditional negative image is filled with false and improper attributions to the personality of Prophet Muhammad. This continues and includes several new prejudices. These are regarded as baseless, ruthless and even ridiculous by many Westerners. These attributions claimed that the Prophet was a tolerant and kind messenger during his Mecca period but turned into a political figure by the political power he gained in Medinan period. Furthermore, he inclined to violence, and his real purpose was political. These claims are a consequence of misperceiving the mission of Prophet Muhammad that is in fact also inclusive of establishing a new social order in contrast to the mission of Jesus. They also originate from the lack of an objective evaluation of the historical and political circumstances concerning the era. As one of the Western researchers who find them baseless, Rudi Paret states that historians should not evaluate Prophet Muhammad from a Christian point of view and the model introduced by Jesus Christ who said his sovereignty does not belong to this world. According to Paret, Prophet Muhammad never acted with force in the formation process of the Arab-Islam ummah in Medinan period. Instead, he considered with great modesty that his most important military and political successes were accomplished thanks to Allah. There never occurred a change in his basic behavior and his mission concept remained the same. Authors like R. Bosworth Smith and Edith Holland state that conditions and necessities in Medinan period required the Prophet to use force. In a book written in 1914 during which his country was battling with the Germans, English E. Holland depicts Prophet Muhammad and his companions as role models and tells that they desire the patriotism of the first Muslims who were ready to give their lives and possessions for the sake of their faith. Edward Gibbon, pointing out that every human being has a right to protect himself and his belongings and to counter an enemy attack, says that Prophet Muhammad was subject to unfair exile and robbery from his own countrymen while performing a peaceful and beneficial mission. His choice of an independent society raised Meccan immigrants to a ruler status and they had complete authority to form alliances and make defensive wars. Many authors from the Western world state that indeed the spiritual side of Prophet Muhammad, that is his prophethood, always dominated his worldly activities; his ruler status had a secondary importance and it was shaped by his spiritual side. The point of view that presents him only as a successful statesman or claims that he depicted two different personalities in Meccan and Medinan periods is wrong. Furthermore, this approach is contradictory to historical truth and misrepresents not only Prophet Muhammad but also Islam. During the Hijrah, contrary to the situation in Mecca, the political aspect of the Prophet (pbuh), in particular his presidential status for a newly founded state, emerged. His political leadership along with his religious guidance, establishment and observation of the relationships between the newly formed Muslim society and other groups grew in importance. Following the Hijrah, the Prophet did not directly become the ruler of Medina, but gained the control of the city when he defeated his enemies in Mecca and other places and when people who accepted Islam came to Medina to join him. Political leadership of the Prophet became undisputed with subsequent developments when most of the tribes in Arabia accepted Islam several years before his demise. Thus a wide political unity was developed under his ruling. M. Watt points out that although conditions were on his side in many circumstances, Prophet Muhammad’s success cannot be separated from his personal skills, his highly developed wisdom, his statesmanship, his diplomacy as a ruler, and his tactfulness and understanding in relations with other people. He also points out that along with the attractiveness of Islam and the fact that it responded to the needs of Arabs as religious and social system, his good behaviors, and political and leadership skills played a great role in his success. The political structure in the Arabian Peninsula changed within a quarter century with the developments under the leadership of Prophet Muhammad. Arabs, most of whom had been living as nomadic and semi-nomadic scattered tribes, for the first time gathered together and became a nation thanks to Prophet Muhammad. The Prophet who had struggled heavily against the dominant religion, social concepts and institutions also tried to form a new moral and social order in a society rotting in terms of these concepts. He eliminated tribal animosities, social injustice, and inequalities, putting an end to the superiority concept which is believed to exist by birth. He removed artificial obstacles that separate individuals in a society. He founded a society based on fellowship, cooperation and affection. He prevented the killing of girls and misbehaviors towards women. He raised the status of women who were living under an oppressive obedience rule to a level that they shared life with men and they had mutual rights and responsibilities. Women could belong to legal professions, purchase detached residences, and spend money on whatever they want. He invalidated the provisions on women in the field of family law (marriage, divorce, and inheritance) and eliminated old perceptions that didn’t regard women as independent individuals. He took the steps to gradually abolish slavery. As a matter of fact, after a short time, liberated slaves (mevali) began to outshine their masters in scholarship, art and other fields. As the entire Arabia came under the rule of Islam in the tenth year of the Hijrah and the regions around Medina became the provinces of the Islamic state, the Prophet usually assigned elite people from his tribe to administer these provinces. His evaluation of the people assigned by him was through merit and personal ability. The Prophet did not hesitate to recall those who were incompetent and to assign those more skilled. He never assigned a person whom he believed was well-informed and skilled in other issues but who would not overcome this task. In administration, the values of faith were more essential than tribal superiority, nobility, wealth and class. Thus everyone was given equal opportunity to achieve according to their personal capacity. Hence it is seen that Prophet Muhammad assigned only competent believers. One of the indispensable actions he employed in administration was the act of consultation. He consulted with leading believers and took their opinions on the issues of significance. He would enact a decision formed by these consultations even if contrary to his own opinion. Holy Prophet was sensitive in removing obstacles between the administrators and those administered. The following hadiths (sayings of the Prophet) point to the implementations of Prophet Muhammad related to these issues. “Whoever undertakes a task for the people and lays out obstacles between himself and the weak, Allah will no doubt form obstacles for him. (Ahmad b. Hanbal, al-Musnad, c. V, p. 239); “Whoever undertakes a task for Muslims and closes his doors to those who are weak, needy and subject to injustice, Allah will close His doors of grace against his needs.” (Ahmad b. Hanbal, al-Musnad, c. III, s. 441, 480) and “Convey to me the needs of those who can not convey them. Whoever conveys to an administrator the needs of those who are not able to convey them, Allah will provide a firm foothold for him on the judgment day” (Bayhaqi, Shuabu'l-Iman, c. II, s. 156; Tabarani, el-Mu'jamu'l-Kabir, nsr. Hamdi Abdulhamid es-Salafi, Beirut ts. (Daru Ihyai't-Turathi'l-Arabi), c. XXII, p. 157). In accordance with this, he would go among the people, walk in the markets, listen to complaints, and take action where necessary. To those assigned by him, he would advise “bring good news, don’t cause feelings of hate; make things easier not harder” (Muslim, "Jihad", 6). He was strongly opposed to his assignees in state works gaining material benefits by these means and strictly controlled them (Buhari, "Ahkam", 24, 41; Muslim, "Imare", 7). Following the arrival of the Prophet (pbuh) in Medina, the Arabic tribes accepted Islam. The Jews were the only tribe that did not accept Islam. Prophet Muhammad showed that he had no prejudice against them, by announcing in his Medina Document that Jews had equal civil status. However after some time it was understood that the Jews did not wish to abandon their idea of being a superior race, and were fearful that they would assimilate into a mixed society where they were ruled by a foreign prophet. Even though the Prophet did not aim to convert them to Islam and only searched for a common agreement ground and an opportunity for a peaceful cooperation, Jews did not provide a solid image of agreement. They became an opposition group in accordance with the conjuncture of the battle against the Quraish. An atmosphere of insecurity resulting from such a growing negative attitude led the Prophet to change his opinion against them. Jews were eventually displaced from the region, not because of religious motives, but because they caused political, social and economic disruption. The Prophet acted in accordance with the diplomatic traditions unless there was a religious obstacle. When he wished to send a letter to the Byzantine emperor, he was reminded that the Byzantine would not read unsealed letters, thus he sent the letters sealed. In concordance with the traditions of Arabs, he called for the use of flags both during his arrival in Medina and in all his military operations. Holy Prophet exhibited great diplomatic precision and wisdom within his letters in terms of the rhetoric and the conveyance of his intentions. It is understood by his messengers’ mesmerizing speeches before the foreign rulers in terms of thoughts and style that his messengers had remarkable diplomatic skills. Holy Prophet acted mildly and generously towards the leaders of other societies and religions and showed respect for them in order to establish peaceful relations and maintain peace. This attitude of him was a part of his foreign policy. Scholars interpreted the following hadith “When a head of a tribe comes to you, treat them well” (Ibn Maja, “Adab”, 19) and stated that there is no criterion such as religion on this issue and that Holy Prophet treated the pagan leaders with modesty and showed high respect for their office. Prophet Muhammad (pbuh) not only formulated principles of social justice but also implemented them. The huge gap between the poor and the rich decreased with economic measures. A balanced and equal environment was formed in harmony with human nature. The poor began to wish the rich goodness, and the rich began to protect the poor. The Prophet first determined a market place in Medina for Muslims apart from the market place where mushriks (infidels) and Jews buy and sell. He ordered that market place would not be constricted with no reserved vending spaces. Furthermore, no taxes would be imposed. In this way, Muslims could easily practice Islamic rules in mutual relations and do business in a separate place without the financial authority of mushriks and particularly Jews. Absence of taxes, the fact that costs were reduced made this market place profitable and attractive. The prohibition against reserved vending spaces was important in providing justice among entrepreneurs, omission of privileges, and encouraging industriousness. Prophet Muhammad stated that suppliers gained earnings and black marketers were cursed. He also tried to ensure the continuity of supply the goods to Medina by prohibiting domestic customs taxes that were taken during shipment. When the Islamic lands were expanded and earnings increased, the Prophet appointed officials to collect taxes like zakat (alms giving), jizya, harac, ushur. He appointed special clerks to record the taxes. He ordered that officials would not pressure people when collecting zakats and they would not perform unfair implementations on them. He also ordered that goods in batches could not be separated to avoid zakat, and separate goods could not be piled together to take zakat. For that reason, when taking zakat, the officials took the middle weight animals, not plump or thin ones. If plumb animals were mostly chosen for the zakat, the Prophet would return them. Prophet Muhammad did not take any of his large shares of taxes taken from the lands that were occupied under Islamic rule, or any gifts given to him. After allocating the yearly expenses, the Prophet spent the rest of it to advance the way of Allah. Despite his great authority and wealth, he lived modestly and asked for only enough giving from Allah. R. Bosworth Smith, who stated that such modesty and simplicity is a fine feature of Prophet Muhammad’s character, points out that he overcame great obstacles, led a marvelous life, achieved miraculous successes and gained the respect of all Arabia. Furthermore, he showed morality that was never before shown by an Arab. He also emphasized that Prophet Muhammad never thought or claimed that he was someone beyond a weak and fallible mortal, and he expressed his admiration for him. Prophet Muhammad showed personal perfection with his actions as an individual in both the worldly and religious fields. He also demonstrated social excellence with his transformation of social life. His life represented balance and harmony everywhere. For the entire text, please see Ahmet Özel, “Yönetici Peygamber Olarak Hz. Muhammed (Holy Muhammad as a Ruler Prophet)”, Divan Ilmi Arastirmalar, 2006/1. Please type '685' into this field.